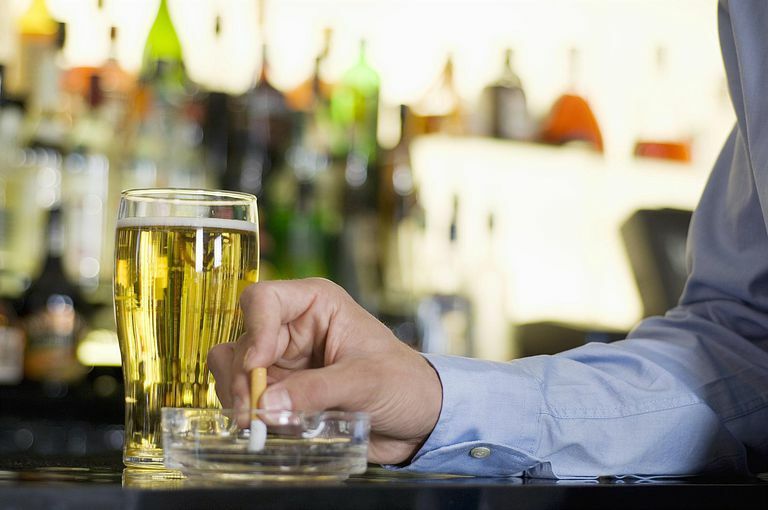 If you crave smoking mostly when you are drinking alcohol, it can be difficult to break that habit. People may tell you that it should be easy to quit because you only smoke when you drink. But alcohol can break your resolve and make it easy to give in to the urge to smoke. Nicotine addiction has two components—physical addiction and psychological dependence. Physical addiction, while intense, can be broken in a matter of days by clearing nicotine out of the body. Psychological dependence involves the associations smokers build up between smoking and daily life over the years, from having a smoke with your morning coffee to lighting up when stressed. For most people, it is the mental side of smoking that ties you most heavily to nicotine addiction. The fact that you link smoking only with drinking does give you an advantage. You can concentrate your efforts to quit on this one area alone rather than having to face triggers every time you turn around. One of the big problems with alcohol is that it reduces your inhibitions. For someone who is trying to quit smoking, reduced inhibitions increase the risk of a smoking relapse. It just doesn't seem so important to stay true to your smoking cessation program once you've had a couple of drinks. Additionally, you will probably be with friends who are smoking, or you'll see other smokers at the bar, making it all the more difficult for you. What do you do when they offer you a cigarette or they step outside for a smoke? Quitting can be done successfully. With a plan and some practice, you can recondition yourself away from feeling like you need to smoke while enjoying a drink or two when out with friends. While your goal may be able to be able to enjoy a drink without smoking, starting with going alcohol-free has advantages. You'll be able to deal with the triggers in that setting without the disadvantage of alcohol loosening up your resolve. Try going alcohol-free for the night. Sip on cranberry juice and seltzer water or something similar. No one has to know if you'd rather keep it a secret. Privately tell the bartender or your server that when you order a mixed drink, you want it served minus the alcohol. Socialize with friends as you normally would and work through the triggers that the situation brings up for you. You will probably need to do this more than once before it starts to feel comfortable. It may not be much fun, but it is the first step in breaking the associations you have with smoking in this environment. Have an escape plan in mind for those moments when you feel like you're about to smoke a cigarette. Get up and head to the bathroom or step outside for some fresh air (avoiding the outdoor smoking area). If that doesn't do the trick, you may want to consider calling it a night and go home earlier than usual. Most public meeting places are going smoke-free, although this will depend on the laws in your area. If your favorite watering hole hasn't yet done so, suggest to your friends that you try out a new place for a change. You are teaching yourself new, healthy habits each time you successfully navigate the situations that trigger the urge to smoke. Practice will cement them in place. Be patient and give yourself time to replace old associations with new ones that don't include smoking. The day will come when you'll be able to socialize with others who are smoking while having a drink or two without it bothering you. You are smart to do the work now to quit because smoking even a few cigarettes is dangerous to your health. And, more likely than not, you would soon find yourself lighting up in situations other than the bar. Nicotine addiction has a way of moving in and taking up more and more of your time and resources. Better to kick it to the curb now.